The Spiritan Community held a reception on March 13 in honor of four confreres who have had books published in the last year. The event was held at Trinity Hall on the campus of Duquesne University in Pittsburgh, Pennsylvania. We invite you to view video of this event. Spiritan Life and Mission since Vatican II by Fr. William Cleary, C.S.Sp. Phenomenology of Human Understanding by Fr. Brian Cronin, C.S.Sp. A Narrative Theological Commentary - Genesis 1-11 by Fr. James Chukwumu Okoye, C.S.Sp. African Traditional Medicine: Antonomy and Informal Consent by Fr. Peter Ikechukwu Osuji, C.S.Sp. 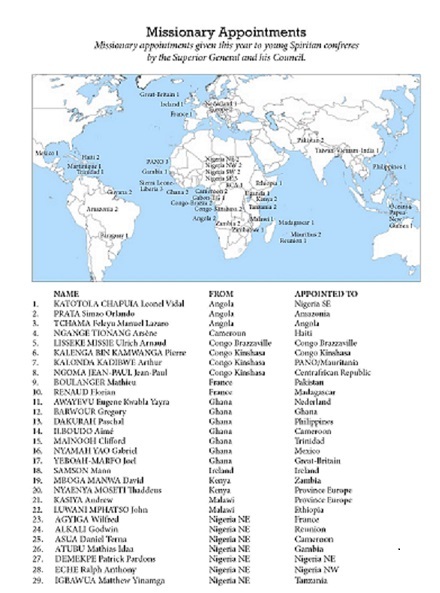 Please view Missionary appointments given this year to young Spiritan confreres by the Superior General and his Council.